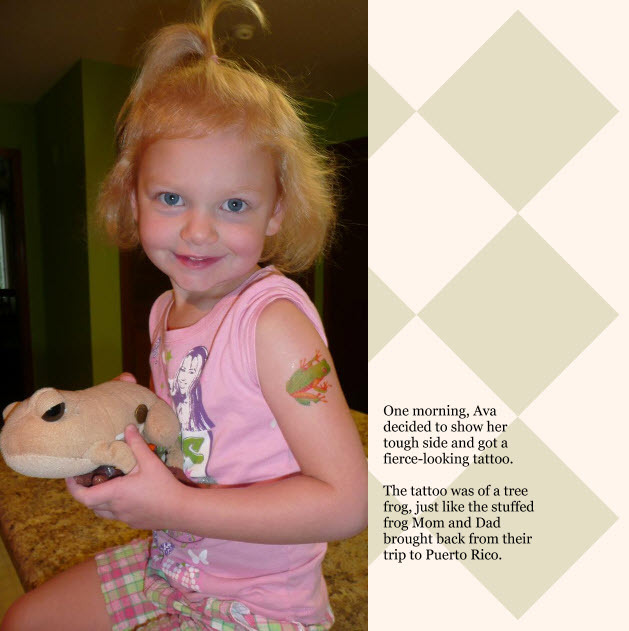 There’s a software product called Booksmart from www.blurb.com that allows you to create and print your own books. Since moving here and blogging, I’ve created “yearbooks” to summarize each year’s experiences, based in large part on my blog entries. The first year I used Shutterfly to print the books (two volumes covering 14 months) but the binding quality was so poor that pages started to come loose the first day I looked at them. 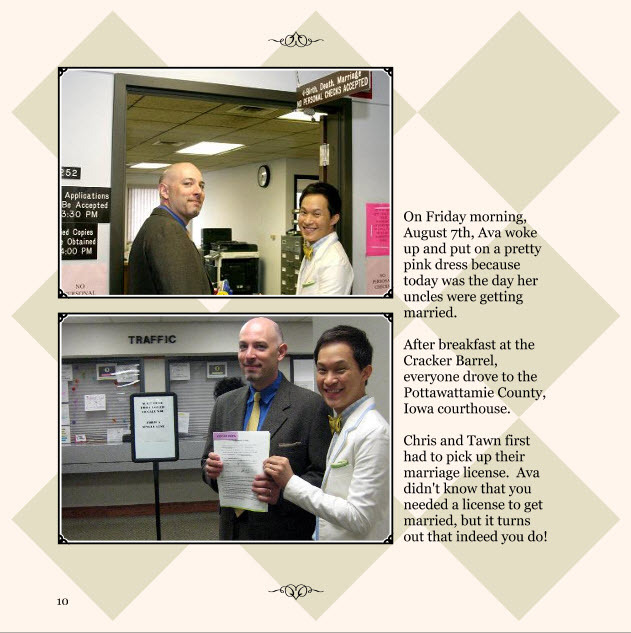 My cousin Alex suggested Booksmart, which she had used to create guest registration books for her wedding, putting portraits of her and her husband Bill on one side of the page and then having the facing page blank. 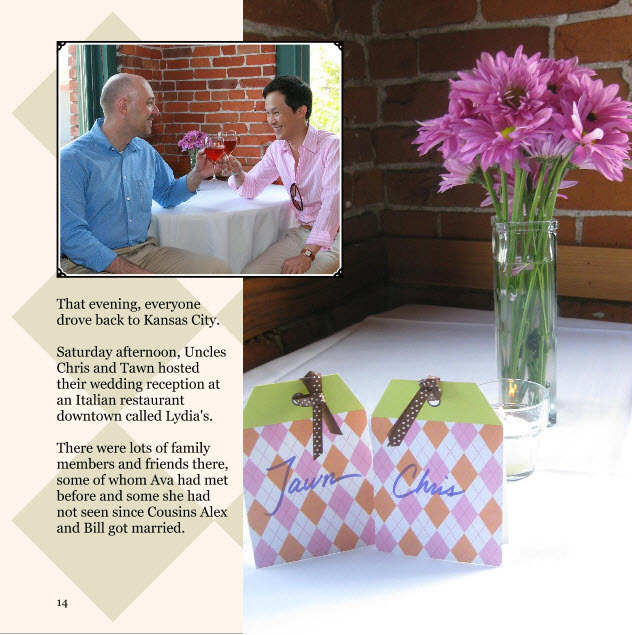 She was impressed with the quality and the costs were much lower than at Shutterfly and many other sites. 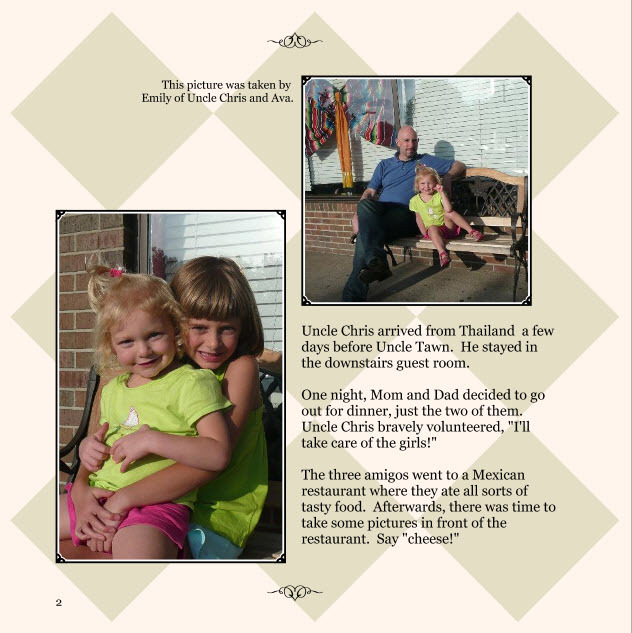 Since then I’ve used Booksmart to not only create yearbooks but also customized books for my nieces. 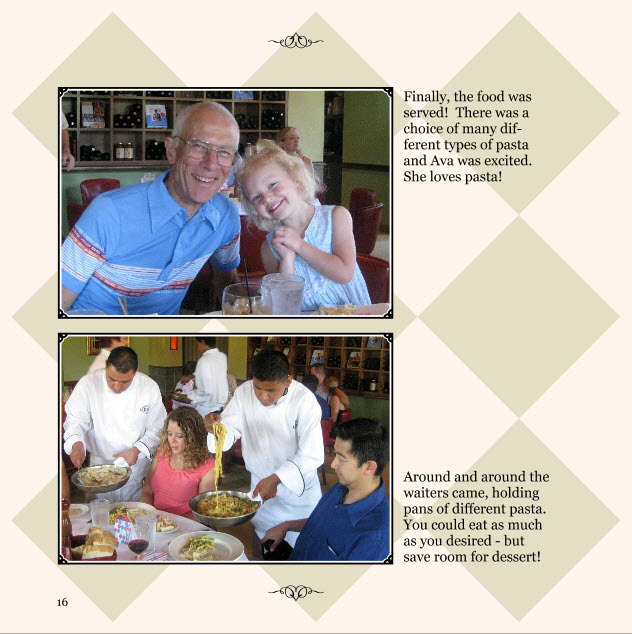 I can incorporate pictures, text and backgrounds into many different shapes and sizes of both hardcover and softcover books. The software is easy to use and allows full manipulation of all layout templates, so you have complete control over the look. 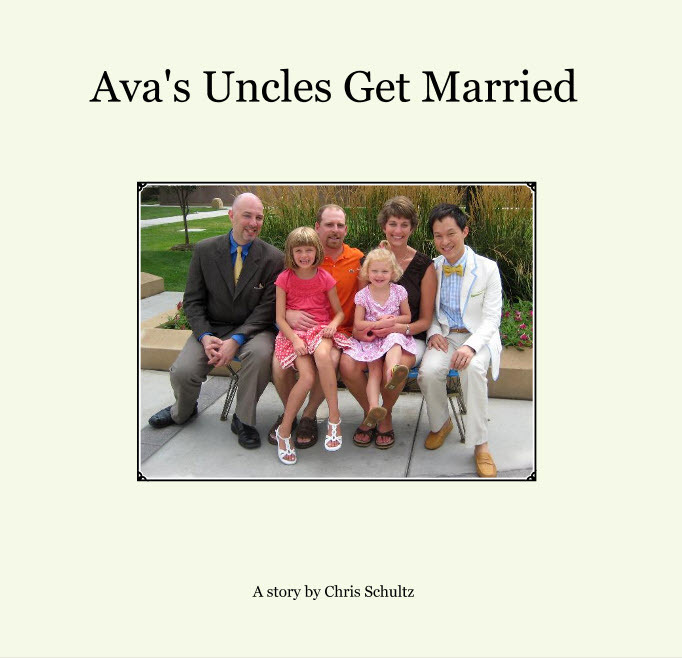 My most recent book is titled “Ava’s Uncles Get Married”. 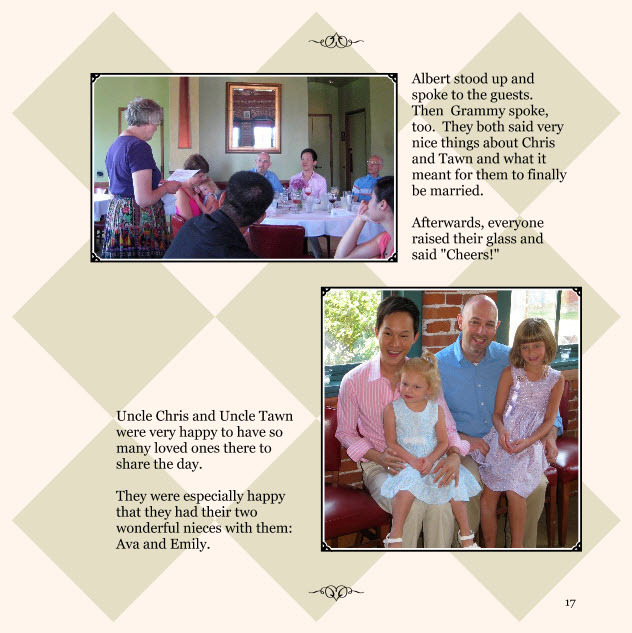 As you might guess, it is a twenty-page tome about our wedding this past summer written for my youngest niece, who will turn four this Spring. I thought I’d share it with you here. You’ve seen most of the pictures and read much of the story already if you’ve been following this blog for a while, so I apologize to any of you who feel this is just a rehash, but I am very proud of this book. I think it is the type of thing that Ava will treasure. While I’ve done a little scrap-booking in my life, I think this comes out looking a lot nicer. 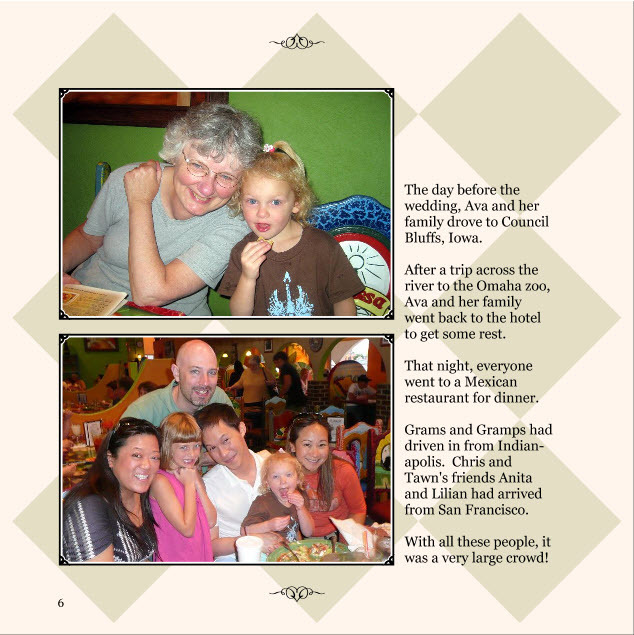 If you’ve been thinking about doing something with your pictures and/or your blog entries, may I suggest you check out Booksmart at www.blurb.com? Oh, and yes, I did used to be the high school yearbook editor. 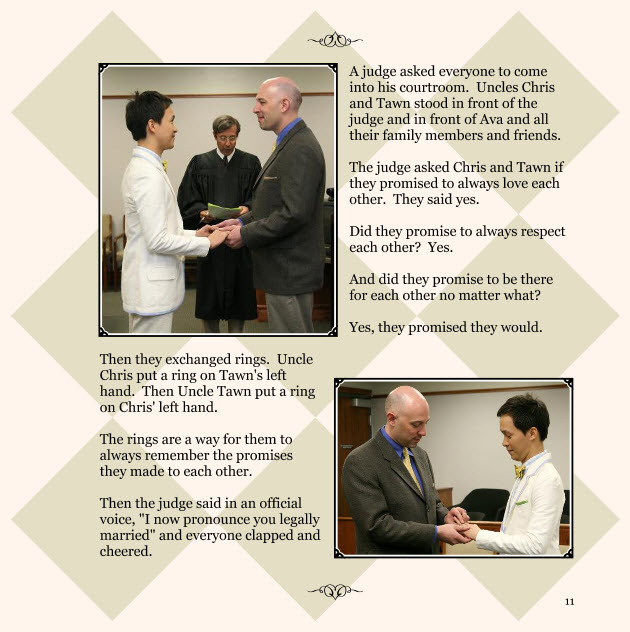 This entry was posted in Uncategorized and tagged Ava, Blurb, Booksmart, wedding by christao408. Bookmark the permalink. Wow! This is impressive and wow! 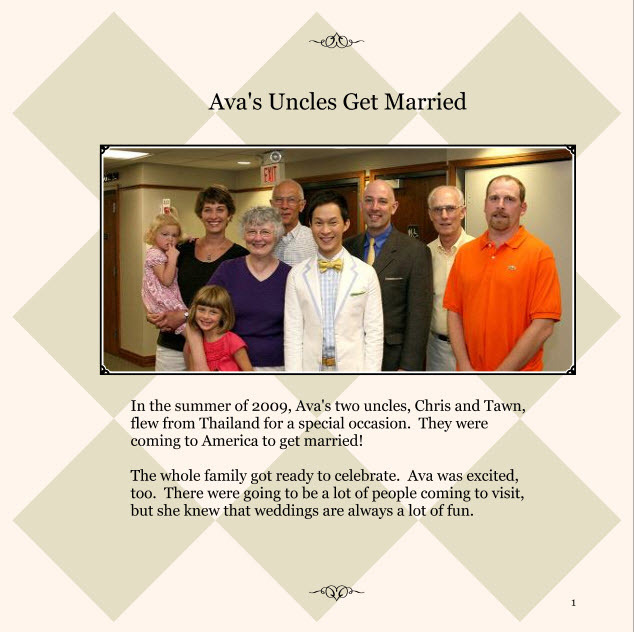 I’m sure Ava will enjoy this but I’d make a couple of copies because I think there might be others in the family that might just want one too. @murisopsis – Printed four additional copies the first time around. May do more as necessary. This is done really well and I genuinely felt as if I was reading a professional children’s book. PS:I still can’t get over Tawn’s wedding look! It’s so chic! And! And! And! 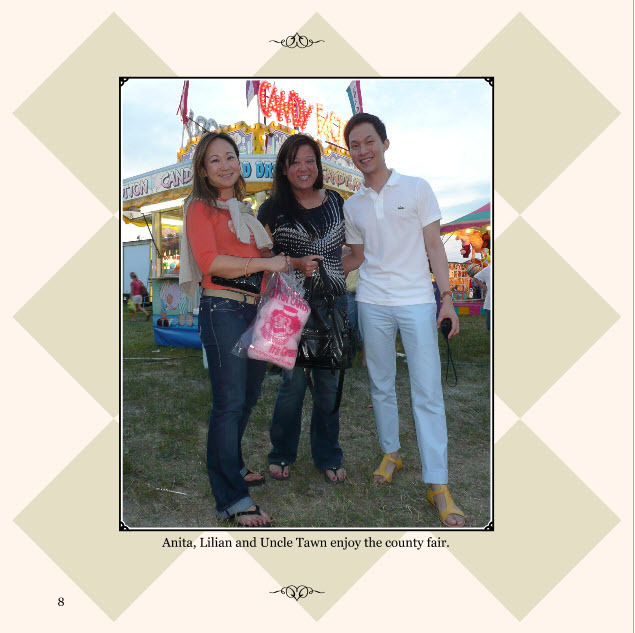 Where did he get that AWESOME sandals he is wearing in the county fair shot? I can’t believe I missed it when you had posted that picture in your blog! I love the design… though I would have preferred a different colour- something basic like brown or black. Wow! Very Nice! You forgot to end by saying,” They live happily thereafter.” hehe. Wish you and Tawn and the family the very best. Aww, this turned out great! I’m sure that Ava will indeed treasure this book. This is very cute :)I’ve done a few of these also. 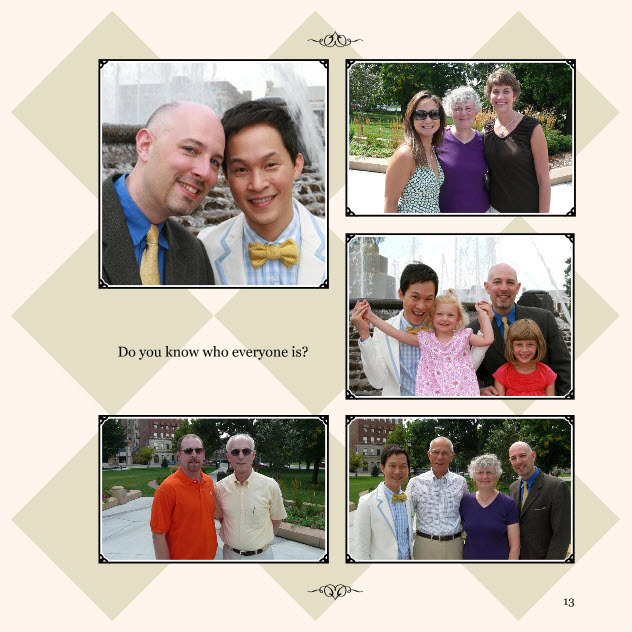 I used to be a scrapbooker quite a few years ago; and I’ve done a few books digitally for wedding presents for friends — I’d take photos at their wedding, and give them a second wedding album containing all the candids I’d shot. I haven’t done one in a while though, and was thinking of doing one again; but I didn’t know where to look. I think I’m going to take a look at this site you’ve used, and see if it’s something that would work for me.How much was it to print? This is sweet! What a cool way to document those memories. wonderful book Chris. 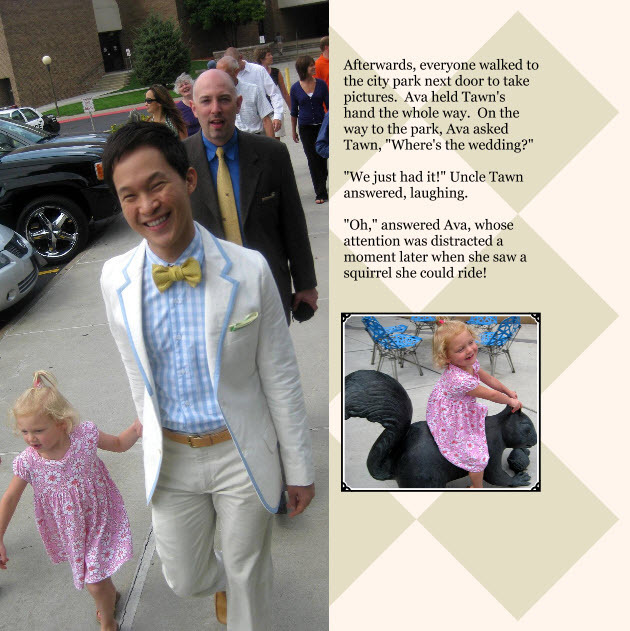 Such a great way to document the day in a way that Ava will enjoy and keep as a treasure. I love using Blurb. Aaw, this turned out so well! It inspires me to do a similar thing one day. Great job and thanks for sharing! We read the book frequently and love it every time! Thanks for making it! I think that Emily was a little jealous even though she already has her own book. 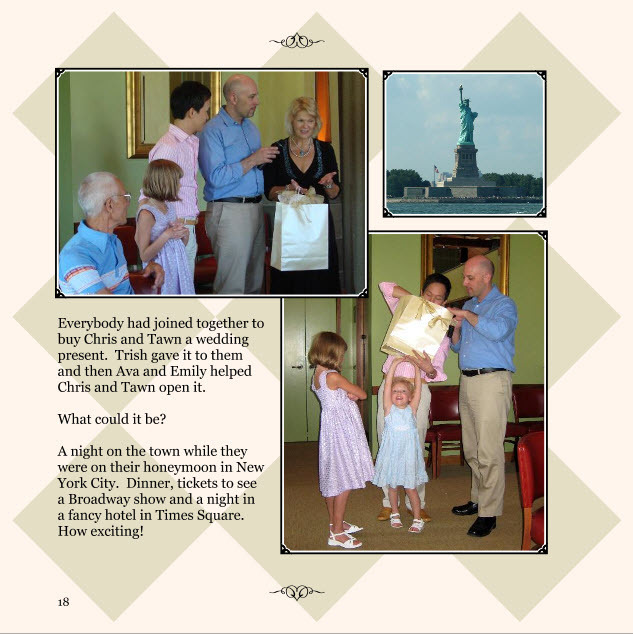 @dynamiqvision – I want to make a book for your kids that documents your wedding, Sion. C’mon – get moving on it! =D@oldpartner – Yes, I figured Emily would be a bit jealous even though she has her own book. Maybe we can plan our spring break so that we go do some fun things, take lots of pictures, then work together to create the book on the last day or so of the trip. We can order it and she’ll have something to remember the week by. 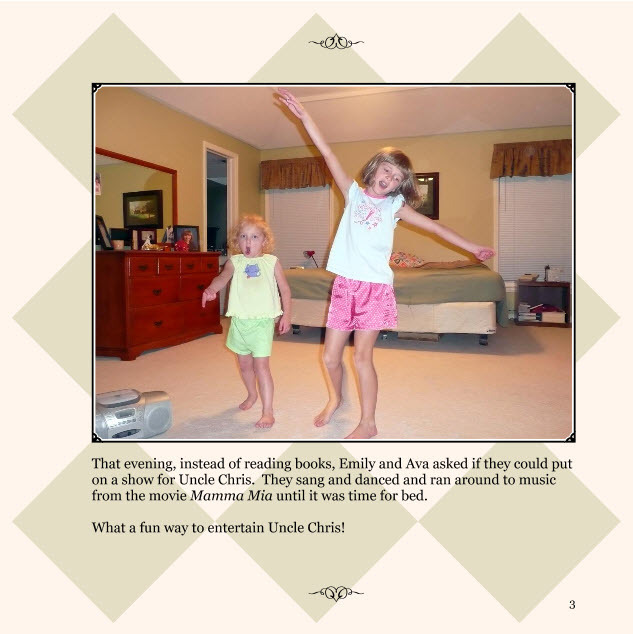 @alextebow – Thanks for introducing me to Blurb, Alex! @epiginoskete – @yang1815 – It sure is and it gives me something to do with the hundreds of pictures I shoot. @arenadi – Mike, I don’t recall the exact price but clicking on the link for this book on the left of my blog, it shows a price of 13 for softcover and 23 for hardcover. The 186-page yearbook for 2007 is 44 softcover, 57 hardcover. Really a good price, I think. @decembriel – @Roadlesstaken – @venice – Doesn’t it just make you think of all these different things you could do? Gets the creative juices flowing. You’re right, Alex, all it needs is a way to embed YouTube videos. Maybe Blurb will come up with a version for the next generation Kindle. @TheCheshireGrins – I printed an extra copy for her so that when she’s older she has an untattered copy. @stevew918 – Oh, that seemed so cliche! =D@Dezinerdreams – I’ll have to ask about the sandals, Vivek. You have provided for them an amzing closet full of memories to cherish always. This is so special and extremely well done. 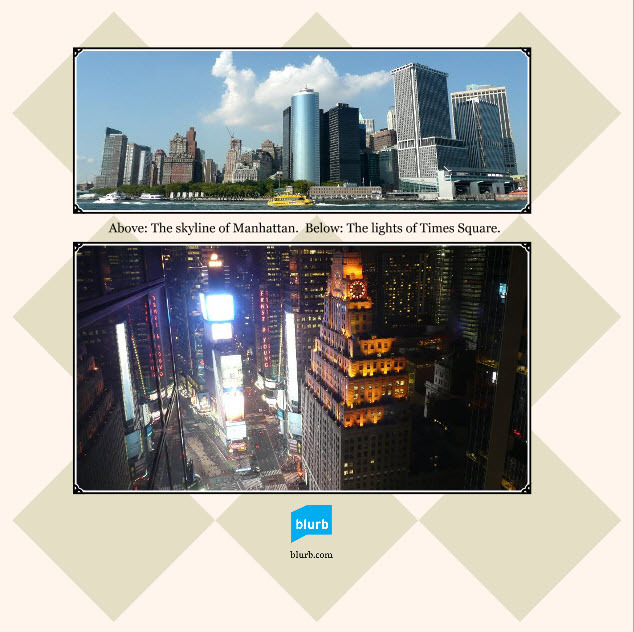 @Dezinerdreams – Hi there, I am flattered by your comments, thank you. The sandles were made by Thai brand called Greyhound. I got it on sale, last pair in one color. I didn’t see them when they first came out. But later I saw someone worn them in black. Some people thought I wear woman’s sandles, but they were not.. or unisex I would suppose.Thai brands are quite polular in Asia now, check out wesites of brands such as Greyhound, Issue, 27 Fridays, Theatre Dression Room, and ANR for boys stuffs. Girls stuffs are: Kolset Red Carpet, Manchu’s, Tu’i, etc. @TawnBino – I checked their website… really nice products and the brand is 30 years old! Yeah, I think it is the yellow colour that makes it look more of a womens sandles… black or brown would look very masculine actually. I will check out the other brands too… thanks! @brooklyn2028 – Yeah, you do have to put a bit of time aside to get it done. @fallingfallingfallen – I hope you take the opportunity to. It is lots of fun. @yang1815 – No, unlike shutterfly and some of these other sites I don’t believe Blurb offers calendars and mugs. that’s such a cute story. ah yes, very similar to Shutterfly here. Neat. 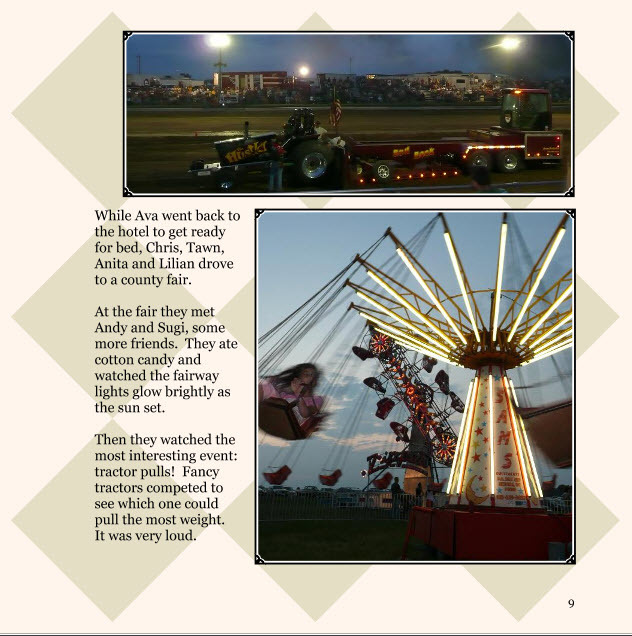 @AppsScraps – Just much better quality and much more flexibility in designing layouts. @oral_fixations – Glad you like it. @Rm2046 – Oh, I look forward to that day! My W compiled something like that too (for his trips), and it’s a neat service where they’ll send a printed book through the mail. I just love the way you organized all the photos together with the decorations. What a thoughtful uncle you are! @TawnBino – I remember shopping at the Greyhound store in the Emporium Mall. There’s a Greyhound restaurant too, which is always crowded! I wonder how much you paid for your sandals? @CurryPuffy – Yes, W mentioned he had used them for that on the Facebook cross-post of this enty. As I like to observe, great (creative) minds think alike. LOL@CurryPuffy – About 1700 baht or so. Seriously! I downloaded booksmart but just recently deleted it without going through with it. I ended up using Lulu.com but alas, their binding is terrible. I’ve requested replacements with a request for QC but alas, I have not received a response as of yet. I will have to try Booksmart next time. I like your set up though! 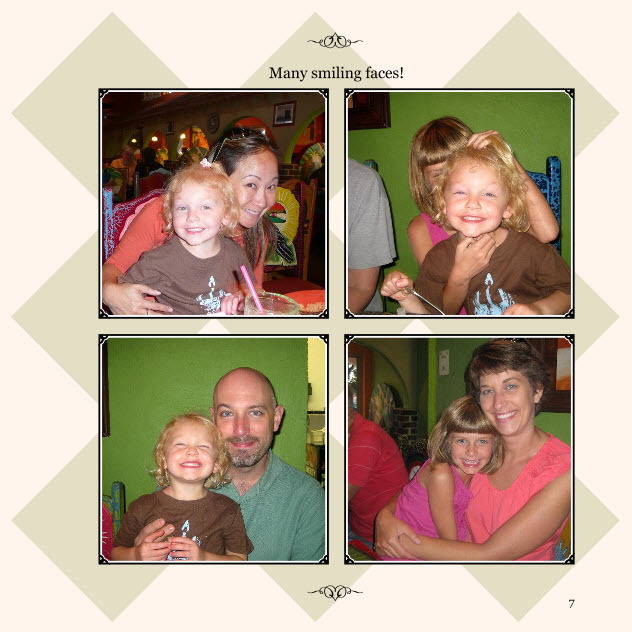 I created a book for my cousin because she was unable to take photos or compile any of her kid who is now 6 years old. I catalog all my photos so I made a lengthy book for her with 6 years of photos from 1 month old to present day. It’s scary how quickly time goes by just by looking at photos. I’m terrified to see 6 years of photos of myself. It’ll be a crazy flip book of skinny me, to normal, then fat, obese, and then semi-fat me. Sigh.But great job!!! Love that you’re keeping up with your highschool yearbook activities. :o) I should’ve joined in highschool as well, but alas, I absolutely avoided any extra-curricular activities in high school, fearing it would tarnish my good name. :o) I kid. @kenpcho – Kenny, you may well want to try booksmart. They’ve added a lot of customization and functionality which I really like. Plus, the quality is where it needs to be.As for the skinny you – fat you flip book, you need to give yourself a break. You’re a handsome guy and there’s no need for you to kick yourself about not looking like a WeHo gym rat. @ElusiveWords – Well, I can try to export a few pages from the software. I’ll let you know if I’m successful. 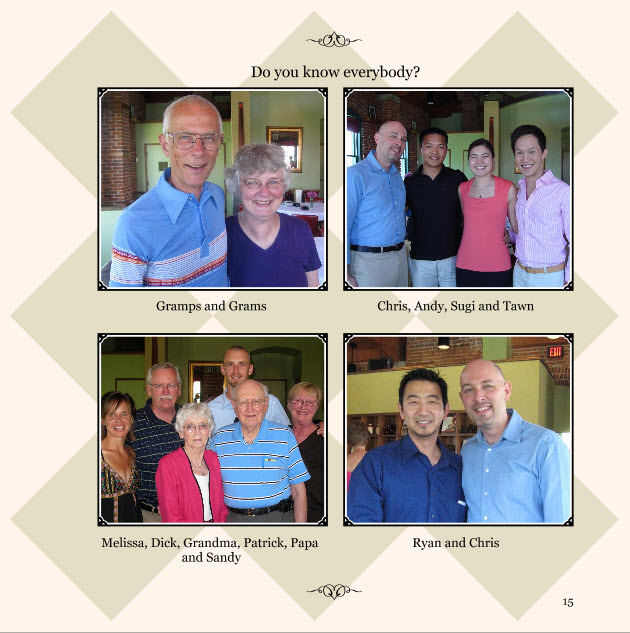 The project is actually a compilation of blog entries so you may be part of the book!